Facial Oils can be beneficial for all skin types, even for oily and acne prone skin. Using the right facial oil can help achieve clear and smooth porcelain- like complexion. 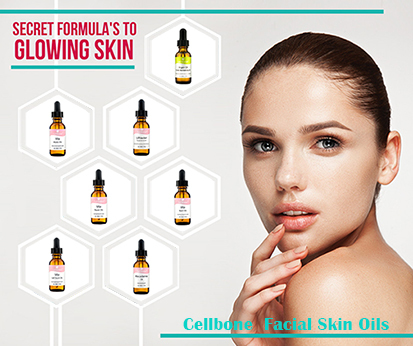 Cellbone facial oils are specially made and packed for topical use, and they will not clog pores or irritate the skin. Apply face oil immediately after washing your skin to lock in moisture, to prevent water loss, and to create a barrier to protect the skin. Our Vita Oils provide antioxidant protections from free radical damage, diminish wrinkles, nourish skin with vital nutrient and minerals and repair dry, damaged skin. The 100% pure organic Argan Oil is produced from kernels of the Argan tree found in Morocco, and it contains high amount of vitamin E, phenols, and unsaturated fatty acid that provide remarkable softening and anti-drying properties on dry and aging skin. Macadamia oil’s Anti-inflammatory properties help heal damaged, weathered skin and improve appearance of scars, sunburns, and shrink enlarged pores. Tamanu Oil helps calm the skin after chemical peel treatment or retinol use. You can also mix a drop of facial oil in your favorite serum or lotion/cream and apply on the skin for an increased moisturizing effect. The lightweight Cellbone Hydra SQ+ 100% Purified Squalane penetrates quickly into the skin and works well even for oily, acne prone, and sensitive skin. Its antibacterial property fights acne causing bacteria, and oil control from oil production and soothes eczema and psoriasis. Lastly, the Cellbone Liftvector Facial Oil Serum is a non-comedogenic, non-irritating oil serum that absorbs quickly into the skin to repair, restore, and renew all skin types as well as shrink enlarged pores and reduce wrinkles. So start incorporating facials oil into your skincare regimen this winter for soft and smooth ageless skin.